Nice (pronounced like "niece") has an exceptional location. Part of the French Riviera, Nice stretches along France's southeastern coast on the Mediterranean Sea. Enjoying a fine Mediterranean climate and a developed tourist infrastructure, it is little surprise that Nice is one of the country's major destinations. Nice as an area has changed hands many times over the last 2,000 years. Originally a Greek colony then a Roman city. Then later an Italian kingdom, only to be conquered by Spain and France. The different powers in the region fought for control over Nice until the 19th century when finally France maintained permanent control, although during World War II the rallying point for the Italians was reclaiming Nice. Since the war, the the city has once again become a major tourist destination which started in the 18th century. Place Masséna is the principle public square in Nice. Until the covering of the Paillon River the Pont Neuf, which runs in the square, was the only practicable road between the old and new town. The square was further divided in 1824 into north and south sections, and with the casino being demolished in 1979 the square has a much more open feel now. The square is bordered by red ochre buildings of an Italian design. This square is the site of many public concerts, summer festivals and parades. The Place Masséna is a short walk from many major sights around town. Place Garibaldi was named after Giuseppe Garibaldi who was a hero of Italian unification and was born in Nice which gives this public square a strong meaning and place in history. A large statue of Garibaldi stands at the centre of the square. Currently the square is undergoing renovations to make it easier for people to walk around. Place Rossetti being located in the heart of the old town this square is a must see. Buildings in red and yellow ochres line the square and there is a stunning fountain in the center. During the day many vendors set up shops and sell icecream while at night the square can get very lively. Cour Saleya was originally the area for the upper classes, this traditional town square has a very nice daily flower market. In the evening there are many great restaurants to enjoy and pubs to grab a drink at to meet some locals. Place du Palais is located on the steps to the justice building of Nice. There is also a large city clock located in the square and the youth have been known to drink on the steps of the justice building. Public events are quite common in the square also. Although some private beaches have imported sand, all of the public beaches are pebble beaches. The water is beautiful though and is amazing for swimming, making the walk on the pebbles well worth it. For better beaches check out the towns of Villefranche-sur-Mer, Antibes, Juan-les-Pins or Cannes. Villefranche-sur-Mer can be reached by TAM bus #100 and is only 20 minutes away. Musee Chagall is a nice art museum. Musee Matisse is an art museum with a good collection. Musee Et Site Archeologiques De Cimiez is the site of the ancient city of Cimiez with good French exhibits on the everyday life of locals during Roman times. Museum of Modern and Contemporary Art houses a very nice collection of modern art in four connected towers. Musee Des Beaux Arts' claim to fame is a good collection of works by Jules Cheret. Sainte Jeanne d'Arc - dedicated to Joan of Arc this modern church was built between 1926 to 1933. Built with with reinforced concrete the church has an Art Deco design, which contrasts greatly with traditional church designs in Europe. The interior paintings are also equally non traditional with a mixture of Russian Cubism and Orthodox icons. The Nice Cathedral (Cathédrale Sainte-Réparate de Nice) is a nice Roman Catholic cathedral in the city center of Nice. The Russian Orthodox Cathedral (Cathédrale Orthodoxe Russe Saint-Nicolas) was built in 1859 this national monument of France claims this Russian Orthodox Cathedral is the oldest in western Europe. Colline du Chateau is a ruined castle overlooking the harbour at Baie Des Anges. Although most of the castle has been destroyed the climb to the top does give a nice view of Nice. The Colline du Chateau closes after dark and people will be forced down. Promenade des Anglais - go for a walk on this stunning coastal path built in the 18th century. Nice Observatory (Observatoire de Nice) - check out this late 19th century observatory located on the summit of Mont Gros. Hiking - Go for nice hikes like the Cliff Walk, which starts about 15 minutes east of town and leads towards Coco Beach although remember it is long hike back up to the road. Or check out some of the other coastal and inland paths around the area. Carnival Of Nice - The Carnival Of Nice, in February, is the major Winter event on the French Riviera during a fortnight. It dates back to 1294 and is one of the largest carnivals in the World attracting over a million visitors to Nice a year. Giant, colourful parades go all day and night with musicians and dancers from all over the World. The final fifteenth day of the Carnival is on Mardi Gras, which adds to the great celebrations! Each year there is a different theme with huge papier mâché figures adorning the parade floats. There are great sporting events like International Half-Marathon in April and Iron Man (Triatlhon) in June, Promenade des Anglais. The Half-Marathon takes place on the legendary Promenade des Anglais and takes the runners through amazing tourist sights of the city and also along the sea. Ironman sees 2,500 athletes take on 3.8 kilometres of swimming in the Mediterranean Sea and a bike course through 17 towns. It attracts 80,000 spectators and an incredibly buzzing atmosphere! Nice Jazz Festival - The Nice Jazz Festival is an outdoor music festival held in July in the Amphitheatre and Gardens of Cimiez. It was the first Jazz Festival of international significance in the World and is incredibly prestigious (and quite flashy). There are several stages where music is performed each evening for eight days. [b]Bastille Day (14 Jul 2013 - 14 Jul 2013) - On this French National Holiday, the traditional French Military Parade will occur, followed by four individually themed parties that simultaneously happen in four different locations along the famous Promenade des Anglais from 9:00pm - 12:30am. Fireworks at 10pm are mind-blowing and go on for 20 minutes. Gourd Festival - This Festival is held in March every year to welcome the coming of Spring! It is held in Nice's Cimiez quarters and celebrates the Annunciation of Mary. Gourds are part of the pumpkin family and are transformed into tasty dishes, but locals also paint and engrave them too. Printemps des Musées - Every year, for one day in Spring, many museums along the French Riviera open their doors for free visits. It falls on the Saturday closest to May 18th (The European International Museum Day) so the general public can participate in exploring their country's culture. La Fête de Mai (05 May 2013 - 26 May 2013) - The Festival of May takes place every Sunday during May to honour the Earth Goddess and the arrival of Spring. A variety of festivities take place, such as dancing, folklore, inflatables, rides, free events, entertainment for all ages, and speciality dishes from locally sourced ingrediants. Musicalia (02 Aug 2013 - 30 Aug 2013) - This cultural music festival focuses on Mediterranean music, with performances teamed with projections, short films and dance performances. It is held in the beautfiful open air Théâtre de verdure, just off the Promenade des Anglais, which can accommodate up to 3,000 spectators. Christmas Village (05 Dec 2013 - 06 Jan 2014) - If you find yourself in Nice over Christmas, this is definitely a must-see and must-do! Fifty wooden chalets sell crafty goods for the festive period. It is the place to stock up on specialities from the south of France as local craftsmen offer a wide range of Chritsmas products from the Riviera. Thanks to the tempering effect of the Mediterranean and the barrier of the Alps, Nice enjoys an exceptional climate all year round. Protected from the wind by the surrounding hills, Nice has very mild winters, with an average maximum temperatures of around 13-14 °C and nights around 6 °C. Summers are dry and warm with average highs of 27 °C in July and August and lows just below 20 °C in general. Summers see a few showers, though half of the annual precipitation of around 800 mm falls from October to January. Transport links in and out of Nice are absolutely excellent and is the reason why so many people from other countries choose to live here. Probably the most efficient method of traveling in Europe is by taking the TGV (high-speed train). You can buy train tickets from almost any main train station in Europe which will ultimately connect you to the TGV network. The TGV system stops slightly short of Nice but the local train gets you there in only 40 minutes. Check the TGV website for more information about schedules and prices. For example, Paris is just 6 hours by TGV from Nice. Trenitalia trains connect Nice to Italian cities like Milan, Genoa, Rome and Venice. For traveling around the coastline just east and west of the city, you will be using the excellent local TER train system. You can book online or check timetables at TER-sncf. Remember to buy you local coast hopping tickets at the machines or at a window before boarding the train. In summer season you can buy a Carte Isabelle for €12 which is valid for unlimited travel anywhere for one day. Great value if you are zipping around. More information here about prices at the TER-sncf tariffs link. Wonderful scenery and great weather make this a great place to explore by car, especially if you like exploring the mountain areas as well as the coast. In summer though the traffic can be terrible so please try to avoid the most obvious times for tourist travel. Begin your journeys either very early before 9:00am or during lunchtime (1:00pm-2:00pm) and don't return before 7:00pm. This way you will almost have the Riviera to yourself as the vast majority of tourists do the same things at the same time. Try not to be on the roads between 9:30am and 11:30am and again from 4:00 pm to 7:00pm. 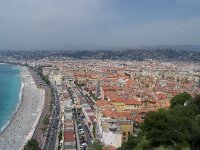 The A8 autoroute is the easiest way to access Nice either from the west (Cannes, Aix-en-Provence) or from Italy. From the east take exit 50 and follow the signs for the Promenade des Anglais which takes you into Nice and is a lovely drive along the coast. Coming from the west take exit 55 and follow the signs for 'Nice centre'. You can connect to and from Nice on the Eurolines system. When you are visiting the direct Cote d'Azur region, the buses are the Riviera's secret weapon. It is only €1 to go anywhere on the whole Alpes Maritimes by bus. Just go the central bus station over the Paillon river and select any number of fabulous daytrips. How about Cannes for the day? Or a lazy afternoon on the beach in Monte Carlo, Monaco? All yours for only €1. To check routes and times visit the Ligne d'Azur website. You can arrive in Nice by ferry from Corsica. Tickets can be bought online for foot passengers or cars at the Société Nationale Maritime Corse-Mediterranée (SNCM) website. Destinations on Corsica include Bastia, Ajaccio, Ile Rouse and Calvi. If you have a yacht you can arrive at many of the Riviera's ports and marinas and be allowed a visitors berth, radio on CH12 as soon as you're in range. Ligne d'Azur operates buses in and around Nice. Most of central Nice is easily navigated on foot. A food called socca, a chickpea flat bread, is a local specialty, as is a tuna fish sandwich called pan bagnat. Other specialities include soupe de poisson (fish soup, made with chili aioli, croutons, and grated cheese), salade niçoise (made with tuna), tourtes aux blettes (sweet tartes made with Savoy cabbage, raisins, nuts, and powdered sugar) and pissaladiere (a type of pizza topped with sauteed onion, olives, garlic and anchovies; it includes no tomatoes or cheese). As may be expected, seafood features prominently in Niçoise cuisine, and several restaurants specialise in sea urchin and oysters. If you are seeking a career aboard one of the many superyachts in Nice a good place to register and start looking is http://www.crew-central.com/|Crew Central..
We have a comprehensive list of accommodation in Nice searchable right here on Travellerspoint. You can use our map to quickly compare budget, mid-range or top of the range accommodation in Nice and areas nearby. This is version 62. Last edited at 3:07 on Aug 2, 17 by sleepBot. 65 articles link to this page.